According to CBS News, thieves are stealing plutonium from an unsecured location near Chicago. 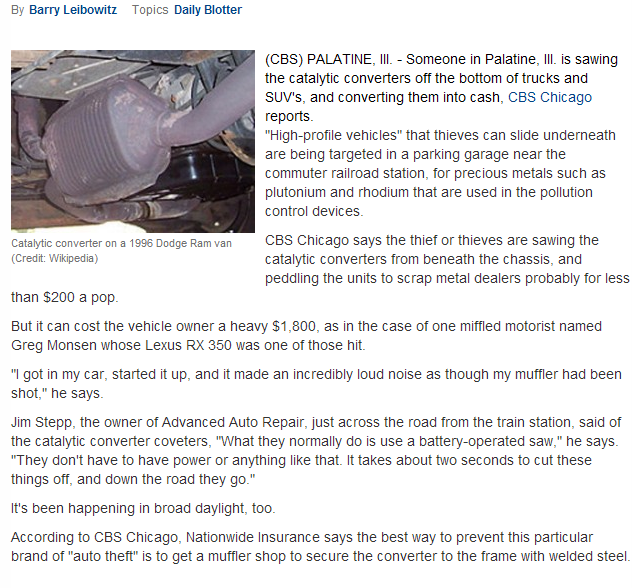 Someone in Palatine, Ill. is sawing the catalytic converters off the bottom of trucks and SUV's, and converting them into cash, CBS Chicago reports. "High-profile vehicles" that thieves can slide underneath are being targeted in a parking garage near the commuter railroad station, for precious metals such as plutonium and rhodium that are used in the pollution control devices. Okay, you must know that plutonium is not contained in catalytic converters for automobiles. But it is scary to think that CBS News does not know that. This simply confirms what we have known about the skankstream media all along -- it is full of radioactive shite. By the time you follow the link, CBS may have caught on to its stupid error, and changed the text of the story. Whether they will acknowledge their mistake is to be determined. The modern skankstream -- like President Obama -- is extremely reluctant to admit any weaknesses. In the meantime, beware the plutonium catalytic converters in you automobiles. Insist on having them changed out for platinum converters as soon as possible.